Back in the 30’s women wore their nailpolish differently. Called a ‘half-moon manicure’, it was supposed to show your good health to those who took notice of your hands. But these days it’s just another cool nail look. 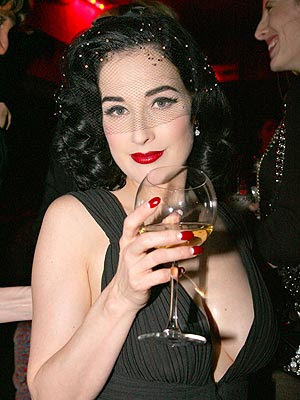 Glamazon Burlesque queen Dita Von Teese is often seen sporting the look. It really isn’t a “new’ thing, per se, but it is being revitalised. Melbournite Glamour Girl Super Kawaii Mama has a great You Tube tutorial on how you can do an authentic 30’s look, which incorporates the double half moon (base and tips). I was not so sure of my painting abilities, and have no stickers to help, so I have done a handpainted ‘faux-Dita’ half moon. I applied 2 coats of OPI Nail Envy (favourite nail hardener), then a single coat of a great white shimmer polish that I got from Petit Ange (they have stalls in a few shopping centres in Sydney), and then two coats of OPI Edin-Burgundy after painting a guide line with a very finebrush to creat the half moon. What I love is that the shimmer is so strong in the white, and this OPI isn’t overly opaque, that there’s a hit on the shimmer THROUGH the red. Finished off with a couple of coats of Nail Envy (I haven’t got any top coat yet), it’s a lovely finish. I think next time I’ll get some stickers to help (some people have had great success with hole punch reinforcers from stationery departments) get the shape right. I really do like the look. It’s simple, elegant, but still a little bit of fun. And I think with some practice, and sticker-aid I could really have some fun with different combinations! Great Job!!! Your nails looks like a professional did them. 🙂 Thanks for the tip about the hole punch reinforcers, I am going to have to try this out now.